Monolith Kamado barbecues are innovative, energy efficient, and high quality stainless steel and ceramic grills with a distinctive design and some excellent features. They are designed to offer an extensive range of cooking methods so that you can prepare a greater variety of food types. 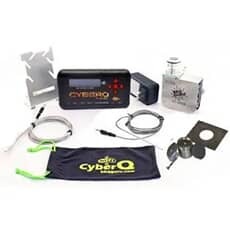 Bamboo side tables, a wood chip feed system, and lid thermometer are just some of the basic features of this high quality, award winning outdoor grilling system. 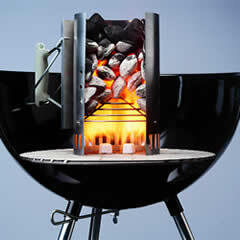 At BBQWorld we stock the three sizes of Monolith Kamado barbecues, the Junior, the Classic, and the Le Chef. 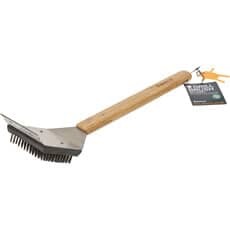 We also stock a large selection of accessories and extras, including smoker pellets, cooking tools, and accessories that will further improve or enhance your barbecuing experience. We offer free delivery on all orders over £50. Call us with any questions about the products we sell, buy from our secure site, or call in to Dawson's Department Store in Clitheroe to see the full range of homeware items including barbecues and garden furniture, kitchenware, and linen. 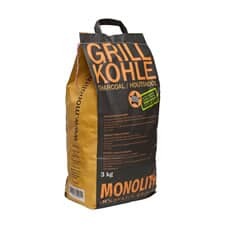 Monolith is a German grilling manufacturer that has taken the traditional Japanese style of Kamado grill, enhanced it, and brought it to the European market. This means that you can enjoy German reliability and ingenuity combined with the tradition of outdoor grilling, slow cooking, and other forms of back garden cooking. Featured in numerous publications and granted innovation and home living awards around Europe, Monolith Kamado barbecues include a 10 year warranty on all ceramic parts, a 1 year warranty on wooden parts, and 2 year warranty on the temperature control fan housing, giving you peace of mind when you purchase one of these high quality and innovative grilling products. 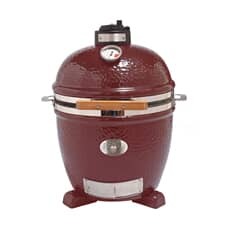 What Is A Kamado Barbecue? The Mushikamado, or movable grill, gained popularity in the Western World following World War II. From here, the name was shortened to Kamado, which literally means "place for the cauldron" but is simply referred to as cauldron or grill. It uses charcoal or wood to heat and cook food, and its design means that it can be used to cook a huge variety of food products. It can boil rice, grill burgers, and it can slow cook large joints of meat for up to 24 hours, thanks to its use of ceramic and stainless steel, as well as its lid and extraction design. 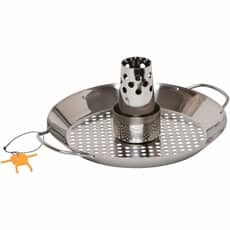 The kamado is also a popular barbecue for those that like to smoke food, and you can buy any of a large selection of smoker pellets to enhance the flavour of your food. The Kamado Barbecue from Monolith is available in three different models, effectively meaning that you can buy a traditional grill according to the amount of food that you prepare and the number of people that you feed. 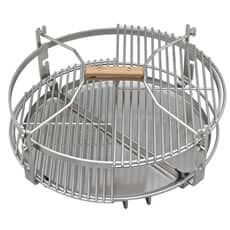 The Kamado Junior is designed for use by 1 or 2 people and is the smallest member of the Monolith Kamado grill family. The Junior is available with or without the sturdy, robust stand. 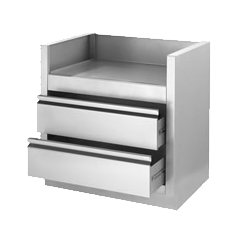 It has stainless steel handles, bands and hinge. 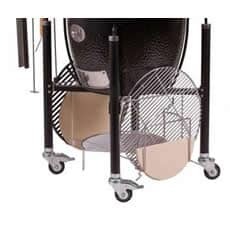 It features a wood smoker pellet feeding system that makes it easy to add the pellets that are needed to create great tasting smoked food products. The clever regulation of airflow in Kamado grills means that they can be used for slow cooking and slow grilling. It is possible to accurately control and maintain the temperature that you need. It is this same airflow regulation system that enhances coal consumption. Charcoal consumption is between 25% and 50% that of a standard barbecue, and the ventilation system means that heat can be retained for as long as 24 hours. The Classic is the mid-range Kamado from Monolith. It is estimated to be able to handle food for between 6 and 8 people. 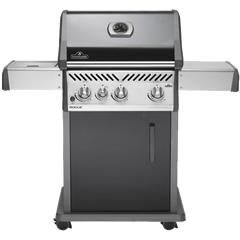 It has all of the same features as the Junior so it has the convenient smoker pellet feeding system, and the chimney and ventilation system combine so that you can start preparing food within 15 minutes of adding the charcoal. 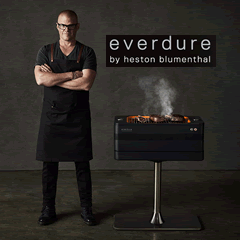 Heat is retained for up to 24 hours, which make this grill a great option for winter cooking. Prepare a stew or broth even when the outside temperature is freezing. As with all models of the Monolith Kamado barbecue, the Classic comes in a choice of either black or red. 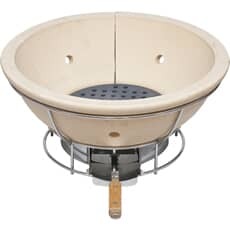 It has a distinctive cauldron like design, and the reliable, German-manufactured stand helps ensure that you can continue to enjoy the great features of your Kamado for many years to come. 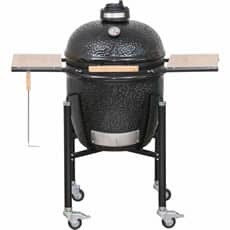 The Monolith Kamado Le Chef is the largest kamado grill from Monolith. 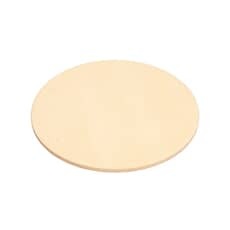 It is ideal for preparing food for large families and parties of six or more people. Like all Monolith grills, it comes complete with accessories and three colour co-ordinated ceramic feet so that the grill can be seated in a table or on an outdoor plinth. Smoker pellets offer a great way of adding extra flavour to your food. 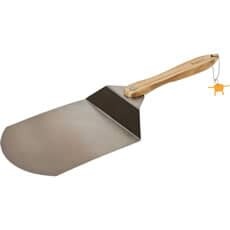 They can also be used to slowly prepare some food types. 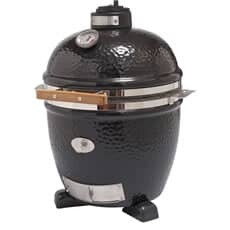 Kamado grills have a smoker pellet system. 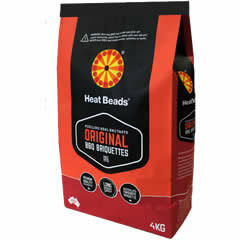 Simply open the pellet door, add the pellets, and use the provided tool to push them into the required position. 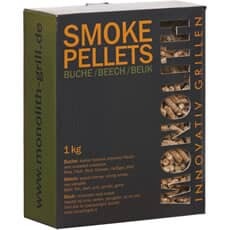 The system is safe and convenient while also ensuring that it is easy to enjoy smoked food. 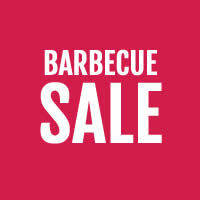 At BBQWorld we not only stock all of the kamado grill models from Monolith. We also stock smoker pellets. Choose from beech, cherry, apple, hickory, maple, or mesquite for subtle flavour differences. We also offer accessories that enhance your cooking experience and enable you to take advantage of the great range of features offered by Monolith Kamado grills. 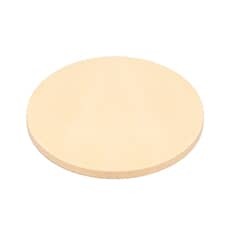 The pizza stone is a great addition, thanks to the slow cooking features of the oven. 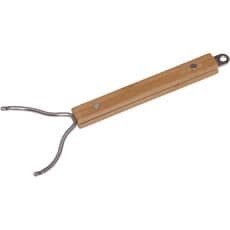 The chicken roaster makes it easy to prepare succulent and properly cooked fowl. 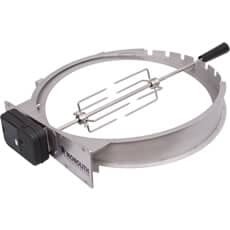 The rotisserie can also be used to prepare chicken, as well as other food stuffs that need to enjoy uniform heating. Your Kamado grill can last a lifetime with some good general maintenance. Whether you are storing your Monolith in the garage or you leave it in a covered area of the garden, it is still a good idea to ensure that it is fully covered, especially during cold and wet months. 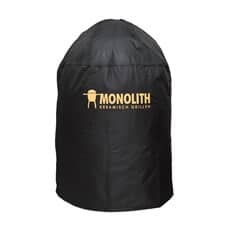 Monolith covers are designed to precisely fit their grills and will protect against rain, snow, frost, and also prevent dirt and debris from getting inside the barbecue and damaging it. 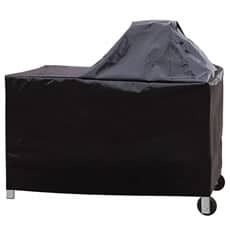 Ensure you buy the right size cover to match your kamado grill. The wide range of cooking styles that can be achieved on the Kamado grill means that there is a need for an equally wide range of tools. 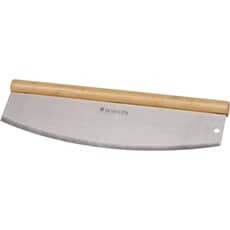 Pizza cutters make it quick and easy to cut pizzas, without having to struggle using a kitchen knife. 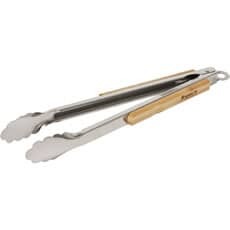 The grill brush is a great accessory for cleaning your griddle after use, and grill tongs are an essential item that let you prepare and cook food without risking burning yourself or damaging tools that are not designed for purpose. 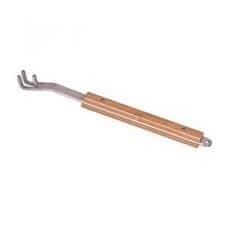 We also stock other tools and accessories like spare rib racks, grate lifters, and more. 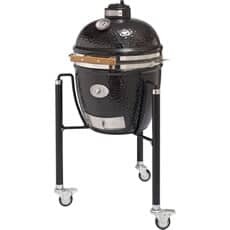 At BBQWorld we stock all sizes of Monolith Kamado grill. We offer competitive prices and we provide free delivery on all orders valued over £50 to your UK address. 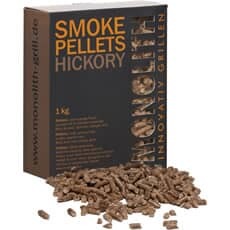 As well as the grills themselves, we also stock items like smoker pellets to enhance the flavour of your food, accessories like rotisseries and pizza stones so that you can prepare a wider range of food types, and covers to protect your barbecue. Browse the site, order using our secure online system, or call in to Dawson's Department Store where you can see all the homeware items that we have for sale. What a great bit of kitComes ready assembled apart from the legsso was up and running in no time. Done 3 low and slow cooks so far - Brisket whole chicken and Beef short ribs. All turned out fantastic. 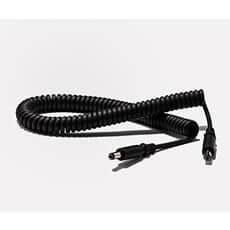 Very easy to light and comes to temperature very quickly. Once familiarised with the air vents the kamado holds its temperature steady for hours using very little charcoal. Cant recommend this enough.